Hot on the heels of teasing the Superb Sportline variant, Skoda has now introduced a brand new edition of its Rapid C-segment sedan in the domestic market. The Skoda Rapid Onyx edition is priced from Rs. 9.75 lakh and has a lot going for it with a number of new features. The Czech Republican automaker has added exterior enhancements to make the special edition unique compared to the regular version. The Skoda Rapid Onyx edition comes fitted with a black finished grille with chrome surrounds, projector lens “quartz-cut” headlamps with integrated LED Daytime Running Lights, glossy black exterior mirror caps, black decorated B pillar and black garnished boot lid. The spiced up exterior is capped off by glossy black Clubber 16-inch alloy wheels and bolt caps as well as black side moulding. 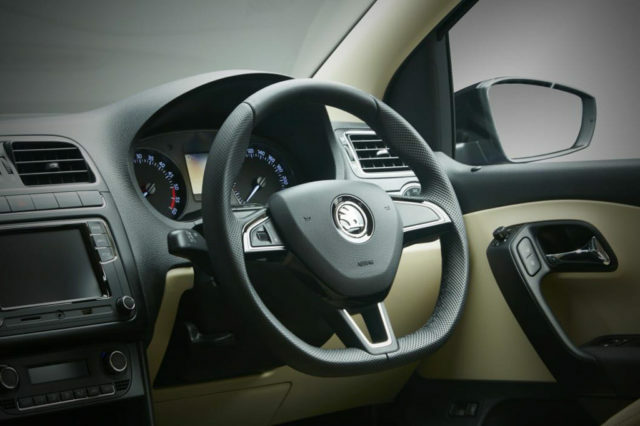 Skoda has carried the same sporty theme to the interior and resultantly the cabin has received two-tone Ebony-Sand colour scheme and perforated beige and wood leatherette upholstery. Moreover, the flat-bottom steering wheel has black stitching and the touchscreen infotainment system features Smartlink technology, along with rear sunshade and scuff plates with Onyx inscription. Besides the Lapiz Blue paint shade, the Skoda Rapid Onyx edition is also sold in white colour. Available across all engine and transmission options, the Onyx 1.6-litre petrol MT costs Rs. 9.75 lakh, while the 1.6-litre petrol AT is priced at Rs. 10.99 lakh, diesel MT at Rs. 11.58 lakh and diesel AT at Rs. 12.73 lakh (all prices, ex-showroom pan India). 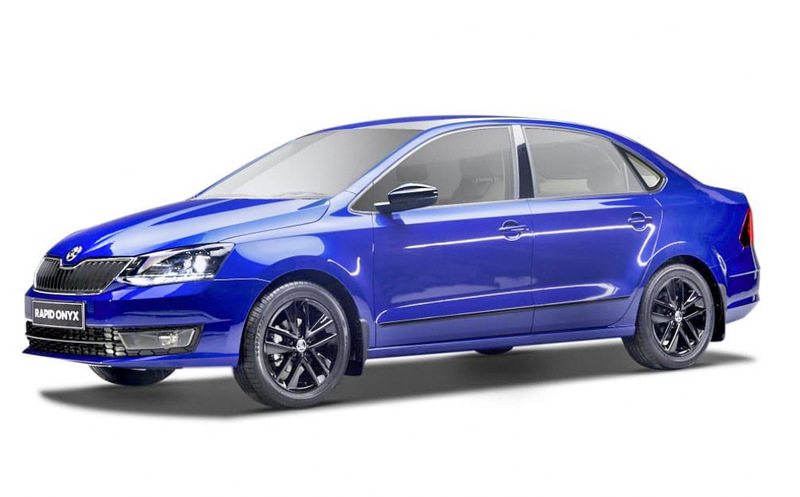 With the midsize sedan segment facing increased competition lately due to the arrival of facelifted Ciaz and all-new Toyota Yaris, Skoda had to respond with a special edition. Skoda is taking the charge for Volkswagen Group’s India 2.0 strategy and is working on MQB AO IN platform specifically for Indian market with investment of 1 billion euros (around Rs. 8,000 crore). It will spawn compact SUV rivalling Hyundai Creta by the end of this decade and is more likely to use small capacity turbocharged petrol and diesel engines. The MQB AO IN based vehicles will have high local content, allowing Skoda to price them competitively. Both Skoda and Volkswagen will launch two new products every year from early next decade to make a strong impact in India.